I have always enjoyed incorporating candy into my baking. Sometimes I just chop the candy into bite-size pieces and mix it right into the batter so you hardly know it's there. Other times, like the M&M's® Cookies or the Peanut Blossoms, the candies sit happily on top of each cookie, demanding our attention. Peanut Butter Cup Cookies take after the latter, where miniature peanut butter cups are sitting on top of a soft and chewy peanut butter cookie. If you think children are the only ones who enjoy these Peanut Butter Cup Cookies you would be wrong as I find adults are prone to sneaking a cookie or two. Peanut Butter Cup Cookies look like miniature tarts and, in fact, are baked in miniature muffin tins. They start with a peanut butter cookie batter. Once made, you place about a tablespoon of the batter into each miniature muffin cup. A fast and easy way to do this is to use a small ice cream scoop. The batter is baked until set around the edges but still soft in the center. At this point the cookies are removed from the oven and all that is left to do is to place one miniature peanut butter cup into the center of each cookie, pressing down gently until part of the peanut butter cup is submerged into the cookie. Now comes the hard part. You cannot eat these little gems right away. You have to wait for them to cool completely. If you try to remove the cookies from the pan while they are still warm, the peanut butter cups are too soft and the cookies will fall apart. So resist if you can for an hour or two. These are excellent at room temperature as well as cold, and they can be frozen. Peanut Butter Cup Cookies: Preheat your oven to 350 degrees F (180 degrees C) and place your oven rack in the center of your oven. Butter, or spray with a non stick vegetable spray, two - 24 cup miniature muffins tins. In a bowl, whisk together the flour, baking soda, and salt. In the bowl of your electric mixer (or with a hand mixer), beat the butter until smooth. Add the sugars and beat until light and fluffy. Beat in the peanut butter. Add the egg and vanilla extract and beat until incorporated. Scrape down the sides and bottom of your bowl as needed. Add the flour mixture and beat just until incorporated. Fill each miniature muffin cup with about one tablespoon (20 grams) of batter. Bake the cookies for about 9-11 minutes, or until the cookies are lightly browned and firm around the edges but still soft in the center. (Note: While the cookies are baking remove the foil wraps and paper liners from each peanut butter cup.) Remove the cookies from the oven, and place on a wire rack. 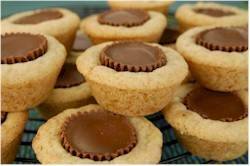 Gently press one miniature peanut butter cup into the center of each cookie while the cookies are still warm. Let the cookies cool completely (about one to two hours) before removing them from the pan. These can be stored for several days at room temperature or in the refrigerator, or they can be frozen. Makes about 40 - 45 cookies.